Visitors from other organisations will not be permitted to take part in any grading. Your Course Fee will grant you entry to all venues. Direct Family Offer: 2 Oldest family members pay full course fee, all other family members receive €10 reduction on the full course fee. Please note the Single Class fee is excluded from the family offer. No tickets will be issued for this SKIF Ireland seminar and spot checks will be carried out. Current SKIF Ireland Licence with Photo will be used for entry to events, No-Licence-No-Entry. The only exception to this rule will be outside visitors from other organisations who will present a seperate International Visitors ticket. Black Belts are welcome at all sessions and Club Instructors are encouraged to attend Kyu Class Training. A €10 additional fee will be applied to all non-pre-registered fees taken on the door. The only exception to this rule will be outside visitors from other organisations. PLEASE NOTE THAT THIS SEMINAR IS A PRE-REGISTRATION COURSE ONLY. Once you reserve your place by email, please transfer your fee directly into our account to finalize your pre-registration. Once we have received your pre-registration by email and your electronic payment, you will then receive a PDF Entry Ticket by email so you can present this at the Seminar. At the upcoming seminar you will see a new seminar pre-registration system being introduced. For this seminar there will be no tickets being issued, SKIF Ireland students will use their current SKIF Ireland Licence with a photo on it for entry to venues. All Completed Dan Applications including the appropriate Dan Application fee in the form of a cheque / bank draft / postal order / electronic payment must be posted to the SKIF Ireland Treasurers address (Aaron Kenneally, SKIF Ireland Treasurer,15 Delford Drive, Rochestown Road, Douglas Cork City, Ireland) by the 20th April 2014. No Applications will be accepted after this date as all applicants must be vetted to ensure they meet the requirements for their grading and have completed the required number of seminars with the Japanese Instructors. Please do not post your SKIF Ireland licence with your application as you will need this for entry to the venues. 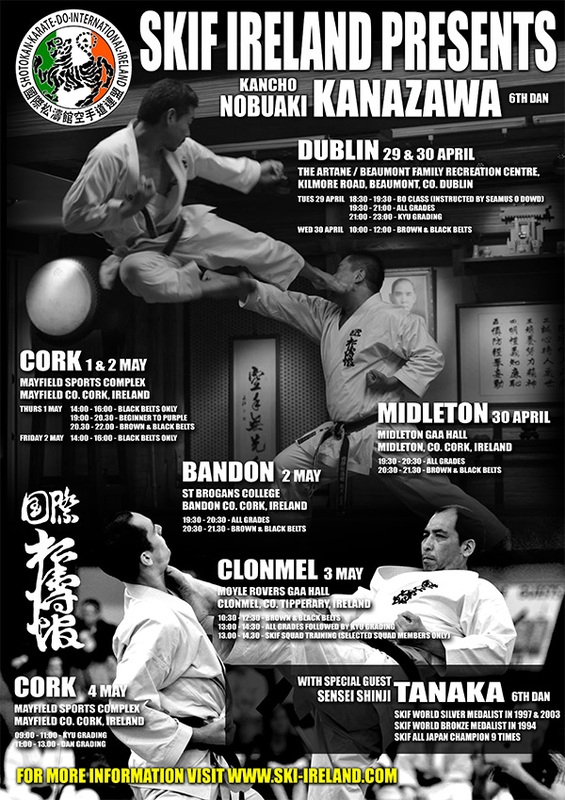 You can submit your SKIF Ireland licence on the morning of the grading and it will be returned to you after the grading. All Junior Dan Applications must be signed by a parent and instructor. Please ensure you print your name clearly on all Dan Applications form as these forms will be sent to SKIF Headquarters in Tokyo Japan and will be used to create your SKIF Diploma, if they cannot read your name properly there is a chance your Diploma could have a spelling mistake which cannot be changed afterwards.